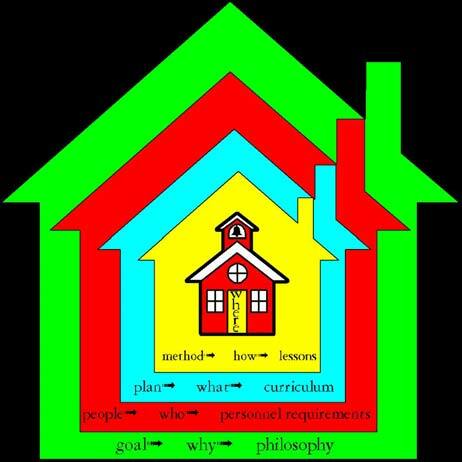 Home / Newsletter / Issue 23 – Oct 2006 / What Makes an NHE School ? Eric Jacobson spoke to us from his 21 years experience as the Director of a successful NHE School in Long Island, New York. The Progressive School of Long Island, now in its 21st year has 150 children in grades K through 8. This year they added on a new building to house the middle school. How – how will they teach itIt is important to understand which of these comes first; which one is the shelter for all the others.WHY Comes FirstEverything is dependent on the school’s philosophy and that philosophy needs to be reflected in all other aspects of the school: who is doing the teaching, what is taught, the methods that are used, and where they are doing the teaching. NHE is not a method, nor is it a curriculum, nor is it a type of building. It is a philosophy with goals that shape the curriculum, the method, the environment and the staff. NHE educators have to know Neohumanism as a philosophy first, and its application to children second. For any school system, you must ask what is the underlying philosophy and the resultant goals of that school. Many public schools have the philosophy and the goal, that the students will become good citizens of that country and be equipped to gain good jobs. It is important to understand the philosophy of NHE and how it reflects in all the other areas. This will give you confidence and inspiration, because the philosophy of NHE is very special. Once you understand your philosophy, you must customize its personal goals for your own area. You have your ideal philosophy and you have your local culture, local requirements and local needs. You have to build a bridge. That bridge becomes your program. You may not be able to manifest your ideal philosophy and ideal goals completely at first. In whatever locale you are in, you need to find out what is important to the people there. What are the people ready for? Then you must apply your philosophy to create customized goals for the situation you are in. Learn your goals and practice explaining them in clear language. You must define your goals. I urge you to think “can I honestly state these goals to the public?” If you cannot state them, you need to write different goals, otherwise you will always be hiding information or over-thinking your responses to public questioning. We must also practice to always bring parent‘s questions about the school back to the goals – to the philosophy. This way they begin to see the guiding force behind your policies and decision making. How will you find teachers? How will you develop them? Another question is “who” can attend the school. Is it for everyone? For example what if there are parents who want something different for their children, and they want to you alter your goals. Do you keep those children in the school? I would say no. You cannot compromise your goals. All decisions regarding “who” must be reflected against your stated goals. What subjects will you teach to each age? Within each subject, what is your outline? What will you take away or add to local curriculum? The “what” is your plan, your curriculum; what subjects you are going to teach. Your curriculum should not have a fixed plan for every child because every child is different. Start with a general plan for each age and then customize it to address the needs of the children in your class. Find out what the local public school plan is. You should know what the local schools are doing and be able to explain how your own curriculum is a reflection of your unique goals. Make sure your plan nests neatly inside the goals and people. For example, you cannot choose to teach material that is not supported by your goals, nor material that your teachers are not qualified to teach. NHE is not a curriculum, but the local curriculum grows out of the understanding of the philosophy of NHE and out of the knowledge of the teaching staff and their ability to translate NHE into that curriculum. What methods will you use at each age? How will you train your people in your methods? How will you evaluate your methods? Next come your methods, the “how”. How will you teach the curriculum in a manner that is consistent with your goals? Stories and games are about “how” you will teach. What is appropriate at one age may not be appropriate for all ages. NHE is not a method, it is a philosophy. Our methods are not fixed. Many different existing methods can be employed and those methods can change over time as new and better ones are discovered. Never answer the question “What is NHE?” with a methods statement! What is your ideal for a building? Where is your ideal locale and environment, and what compromises are you willing to make. When starting PSOLI school, I had to compromise with owning the building – but refused to compromise in starting the school in a home because that would limit the number of students that could attend and the type of school I might be able to grow. The underlying ideal neohumanist philosophy of PSOLI is to develop love for all living entities, making life as a mission and becoming one with all things. How does this translate into PSOLI’s specific goals? PSOLI serves children from ages 5 to 14. What do I want that 14 year old to leave with? Of course I have thousands of goals – but I need to simplify it for public dissemination. 1. 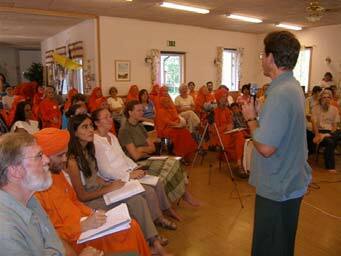 Counter Pseudo culture – A number one concern of parents is pseudo culture. NHE addresses pseudo culture. There is a difference between pseudo culture and true culture. You can see this reflected in the artwork of the children, in their drama productions and in the music they sing and play at school. 2. Long Term Learning – They will remember what they learn for the rest of their life. 3. Service – Parents want their children to do good things. 5. Morality and Behavior – Parents want their children to be good people and to behave in nice manner. 6. Personal attention – Parents don’t want their child to be just a number; they want them to get some personalized attention that will address their unique needs. Most people think of education as a competition and they bring their child to private school to give their child a leg up on the competition. I tell them that I could force their child to do anything for a limited amount of time – but when they are older they will do whatever they want when I’m not looking. I want to create the desire in your child to do something with their life. If they don’t feel their life has any purpose, they won’t have any desire. On the contrary, a child with purpose outperforms all academic expectations! Does the dog lead the walker or vice-versa? The walker is your sense of mission, and the dog is the academic learning. The dog will get a nice long walk if the walker is full of health and energy. The dog should not be the main party in the relationship, that is, academic learning should not be the leading causal event in daily school life. Students at PSOLI achieve at a much higher level than most public schools. This is not due to more academic work. We don’t give them more work – we give them more confidence, desire and direction… and the work takes care of itself. In his second presentation, Eric Jacobson shared his school manual. Though written specifically for his school in Long Island , New York , USA , the manual has some general applicability for others. The manual is arranged by subject and each subject is addressed first through how the Philosophy of NHE is applied to that subject, then how the Methodology of NHE is applied to that subject and finally the curriculum content of that subject is minimally discussed. Eric emphasized that each school needs to custom make goals and curriculum to meet the needs of their locale, so this manual cannot be followed word for word. Each director must apply their intellect and design their own program. However the general discussion of applying the Philosophy and Methods of NHE to each subject may be helpful to other schools. The manual is for sale to those working in NHE schools. Please see the publications page for details.